Does this scene sound familiar? You are ready to have Bible time with your toddler, so you pull a children’s Bible off the shelf, snuggle up together on the couch, and start reading. In less than 30 seconds, your wiggly toddler turns all the pages in the book, attempts to climb on your head, and then slides off the couch to run off and play. Well, besides the fact that toddlers are just energy filled and unpredictable, it could be that the children’s Bible you were using was not the best choice to use as a toddler Bible. 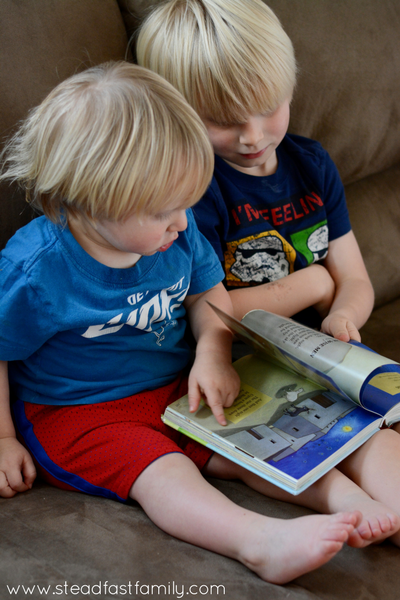 There are a lot of great Bible storybooks out there that are better saved for kids who are a little bit older, have longer attention spans, and have moved past the tendency to use the couch as a jungle gym during story time. 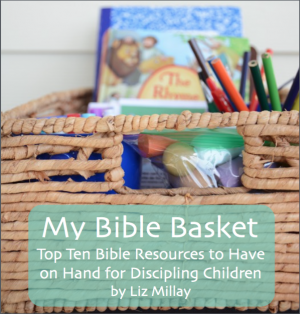 What makes a great toddler Bible? Just because this Bible is for the littlest ones, doesn’t mean we can stray from Biblical truth! This is the most important thing and something you have to watch out for when selecting a toddler Bible because there is a lot of fluff out there for this age group. 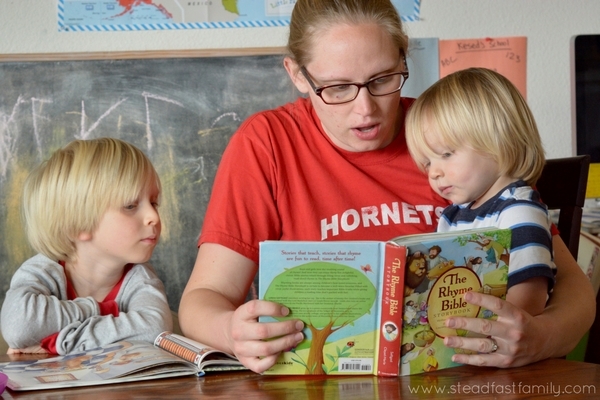 At first thought, the pictures in your toddler Bible might not seem that important. However, when you think about the fact that your toddler can’t read and will mostly likely enjoy flipping through the pages of this Bible over and over, taking in those images many many times – all of a sudden the illustrations seem a lot more important! Toddlers aren’t exactly well known for their ability to handle delicate objects, amiright? #4 Engaging and Toddler Approved! Here’s where the rubber meets the road! Does your selected toddler Bible actually engage said toddler? Flowery and drawn out language is not appreciated by short attention spans. Now, that doesn’t mean the words need to be dull or dumbed down, but you probably don’t want multiple paragraphs on each page either. Dr. Suess was on to something..
Rhyming keeps you wanting more. Finally, a little bit of action goes a long way. God created light? Close your eyes tight and then open them wide. Jonah in the belly of the fish? Pretend to swim. Daniel in the lion’s den? Roar! 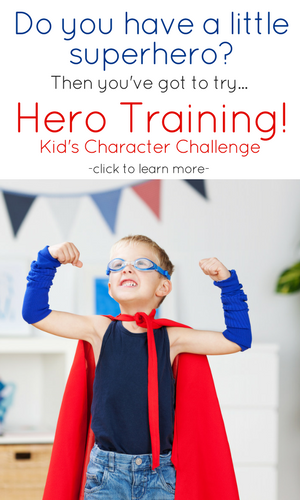 We’ve tested out a lot of storybook Bibles and are always on the hunt for more! Since my six year old mainly reads from the actual Bible now, storybook Bibles are generally used for my toddler, so I’m always excited when I find one we love! Click the title to read more about that Bible. This is without a doubt our most favorite toddler Bible. It checks pretty much all of my boxes and has been well loved by every toddler I’ve read it to. When we misplaced our copy in our move, I finally had to buy another one because we didn’t want to be without it. Read our in-depth review of this Bible here. For an even simpler version of this Bible, you can also try the toddler specific version: The Rhyme Bible for Toddlers. I picked up this neat toddler Bible at the library a while back and thought it was really fun! 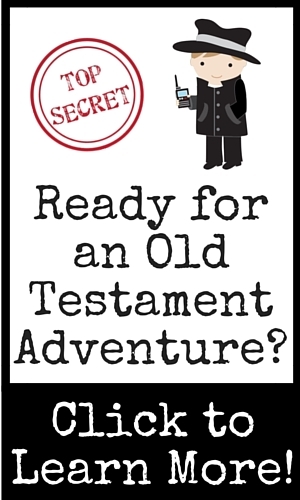 It is a little different than your normal Bible and it has actions to go along with each simple story. A story you don’t have to sit down for? Every toddler’s dream! I will not lie. It was not love at first sight with this Bible. Quite frankly, I thought it was…boring. So, I didn’t use it much with my firstborn. However, my current toddler totally latched onto it being “his” Bible and he loves it. And, I’ve learned to appreciate it too. It’s a classic for a reason and it does have some really good things going for it. My top two are that the stories are kept short and simple and I love that it has SO MANY stories to choose from that other toddler Bibles skip. This one also has a toddler specific version. While these aren’t storybook Bibles, they are excellent Bible based books that are perfect for toddlers. This book is so fun! It has lots of excitement – making it perfect for keeping the attention of toddlers. Best of all, it does a great job outlining the Gospel for little ears! Not just one book, but now FOUR! The Baby Believer books are awesome and perfect for babies, toddlers, and even that big kid listening in. 🙂 Full of Biblical truth, perfectly packaged for little hands and little hearts. We own the first two, First Bible Basics and Psalms of Praise (our favorite!) and I can’t wait to get my hands on the two new releases in the series! 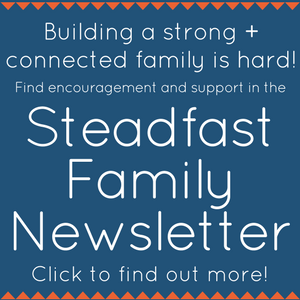 You can find a video of my kids and I demonstrating Psalms of Praise on the Steadfast Family Facebook page HERE. 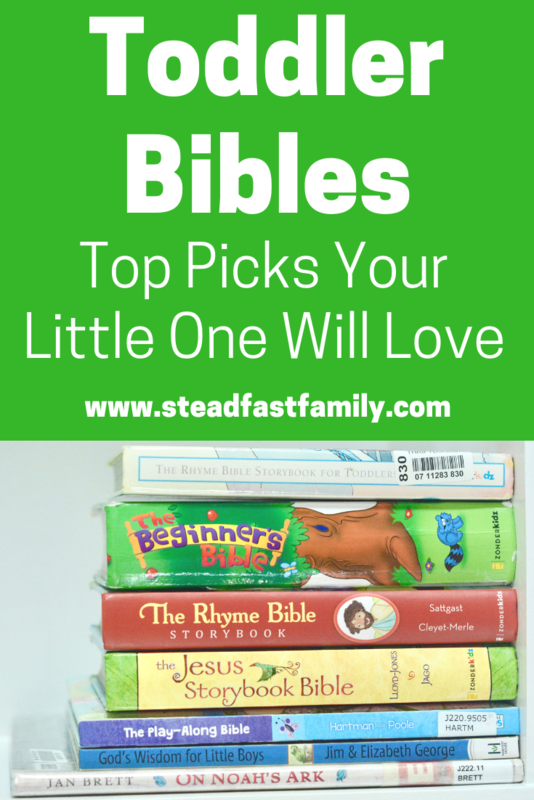 This list wouldn’t be complete without mentioning the absolute, without a doubt, best Bible for toddlers… well, the best Bible for any age actually! I know, I know – you might be thinking “there’s no way my toddler is listening to the actual Bible.” But here’s the thing, the power is in God’s Word. His actual, real, life giving, Word. It’s important to give your child a taste of the real thing from the very beginning. Start small: a short memory verse, a parable, a Psalm. 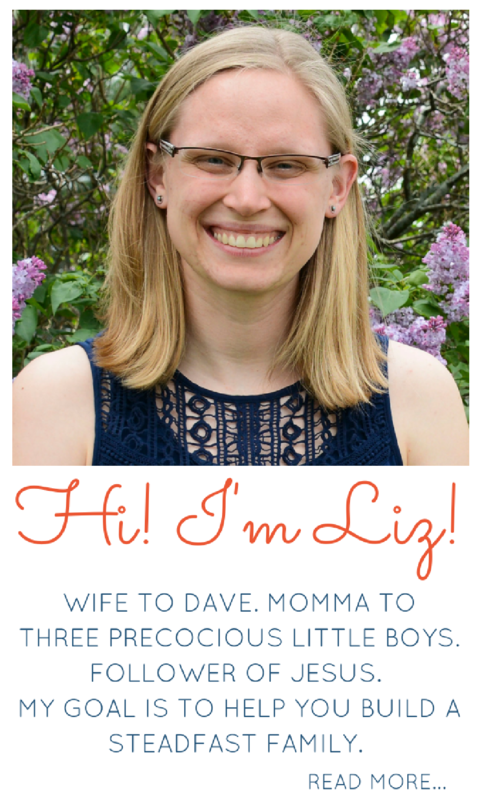 Play an audio Bible in the background while your child is playing. You will never regret exposing them to God’s Word from an early age. Like I said before, we are always trying out new storybook Bibles, hunting for ones that pass my pickiness test! 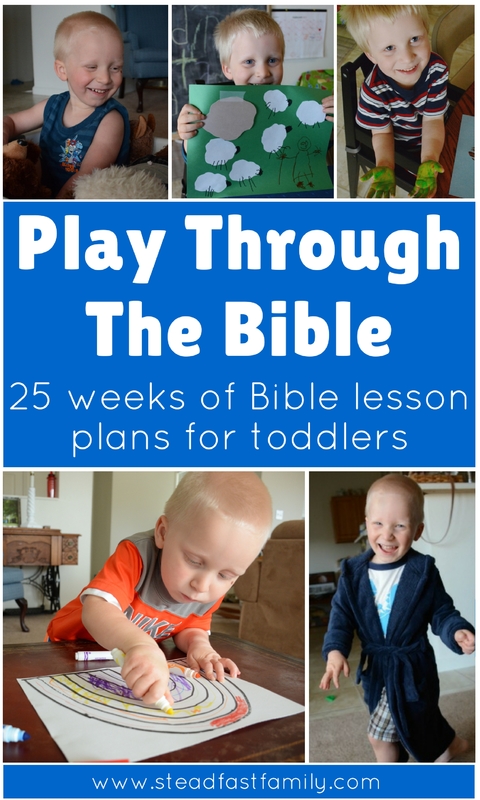 So, I’d love to hear from you if you have a toddler Bible you think we should try out! Just leave it in the comments below! I’ve already found this list with some new ones that we need to check out! I’ll update this post if we find any more that we love!